In very ancient days water wheels were developed to convert hydraulic energy into mechanical energy. Nowadays water turbines are used for the same purpose. Basically, these water wheels are used to lift water from wells for irrigation purpose. Due to its very slow moving speed, water wheels are not suitable for all types of purposes, especially energy generation. The hydropower was available mostly in rural and mountainous regions. So, it was necessary to install mills which are run by water wheels near to the power stations. The main disadvantage of this system was to run prime movers round the clock, even if some of the machines in the mills may remain idle. So, Why Water Turbines are developed? Hence to overcome the problems arises from water wheel mechanism, a lot of research was conducted by numerous scientists and engineering people. To improve its performance, engineers took huge efforts. Hence after intensive research Water Turbines were designed. The water turbines developed in those days can be operating under very high water head and higher speed. The highest water head used to operate water turbines is 1765 meters and was used in Austria. For driving machines in industries, electricity is widely used. Hence to cope up with increased demand for electric power, high-speed water turbines are designed. Due to the rapid increase in the use of electric power, the transmission of electricity from the remote hydropower station to the far-off places was considered necessary. At this point, water turbines occupied an important position among prime movers. Atomic Energy is clean and environment-friendly but still, there are some problems to generate it on a large basis. Mostly Thermal Power Stations are in operation in India but it develops many environmental and health problems also. Comparing to these two forms, Hydroelectric Power has more advantages. Today, the water turbines are taken to be the backbone of electricity, which is considered to be one of the important factors for the prosperity of a nation. So, How Water Turbines are Classified? 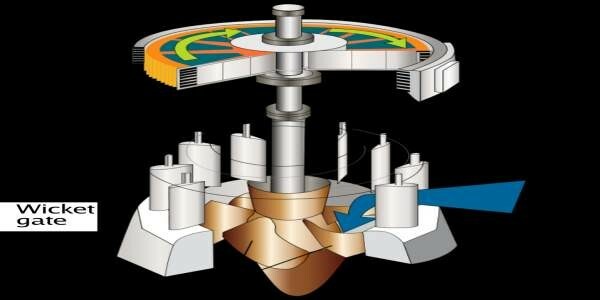 What are the Advantages of Water Turbines? 01) They can work under any water head. 02) They can operate at very high speed. 03) They can be controlled automatically. 04) They have very long working life. 05) They are more efficient and can be easily controlled.